Fireplace screens are practical, and they can be pretty too. A lot of folks who don't even burn fires very often choose to have screens to improve the look of their living room (or wherever the fireplace is located). A handsome screen can be a huge improvement over an empty firebox (or a firebox that is stained with charred remains of old fires). You can get screens in various materials and styles, and you can even find ones that are centered around various sports team logos (visit this fireplace screen article for more on that one). With autumn coming up, you'll start seeing screens at various home and garden stores, but you'll always find a bigger selection online, so don't be afraid to order over the Internet. The costs of fireplace screens vary a lot, depending on the material and the design, and naturally a handmade model will cost more than something mass produced. 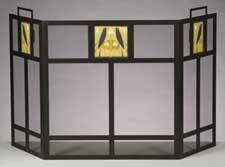 Stained glass elements will usually run you more than straight mesh and ironwork. Expect to spend anywhere from $50 to $300 for a fireplace screen. The bellows is a classic way to help a fire gain momentum, but you might look a little strange whipping one of these antiquities out at a tailgating party. Instead of looking strange, you can look innovative, by using an Air Grill Executive Blower. "Newly updated for the twentyfirst century, the air grill blower is a modern take on the old fireplace bellows. 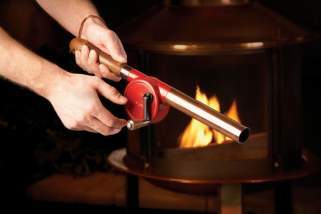 Just a few turns of the wood crank generates a strong stream of air that you can direct at your BBQ, chimenea, wood-burning stove, or fireplace to ignite wood or charcoal safely and efficiently." Sure your manly BBQing buddies might look at you a little oddly at first, but when they see the flames roar to life, they'll be wanting to take a turn at the handle. I admit... it does look a little fun. The executive model is $30, but you can get the original basic unit for $10. There are lots of purely decorative items people place on their mantels and around the hearth in order to spruce up their fireplaces, but you can start by perking up some of the functional items as well. If you burn wood, chances are you have a set of tools: shovel, poker, brush, etc. If they're the plain black utilitarian kind, you might try shopping for a set that's a little more interesting, something that complements your interests or the decor of your home. 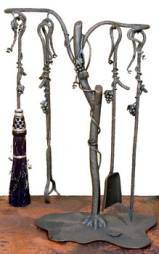 This vineyard fireplace tool set would be a nice choice for a wine lover or anyone who's got a Tuscan theme in the living room. It's available from Littman Bros, though at $1,700 it might be cheaper to buy the vineyard. If you use your fireplace or wood-burning stove often, you know how much room kindling, log holders, fireplace tools, and the various related accouterments can take up in your living room. One way to save space is to combine several tools into one set. 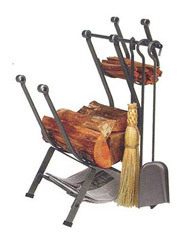 For example, this front-loading log rack includes a rack that supports a poker, ash shovel, and broom. There's room on top for a separate kindling section, and on the bottom you can stack a few old newspapers, which are of course the cheapest fire starters in this day and age. 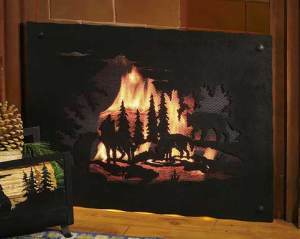 The fireplace screen (which is a useful accessory since it's designed to keep sparks from leaping out of the flames and landing on your floors, rugs, passing cats, etc.) is an opportunity to add some flair to your living room. Sure, you can get a plain old mesh thing that does the job, but why not accent your decor? A fireplace screen is a great place to add a bit of your personality. Don't get something drab and plain if you can afford something that will impress guests and--more importantly--please you every time you look at it. This screen has three tiles with beautiful songbirds embedded in it. The tiles are actually interchangable, too, so you can insert different tiles with different pictures on them depending on the season (or your mood). Created by the Motawi TileWorks Company, the fireplace screen itself is crafted of durable heavy-gauge steel and powder coated with a heat resistant matte black finish, so it will stand up year in and year out. The price is $650, which includes the tiles. Well, this acorn match holder is a fun accessory that could also help you keep track of your matches. It's designed to hold wooden matches, so you'll also have a nicer quality to use to light a fire than what you're used to if you just have the freebies from the convenience store. The acorn match holder is $10 from Collections, Etc. 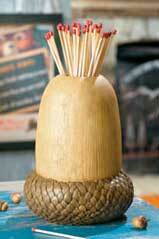 Everybody knows a little targeted air can perk a fire right up, but how many people actually own a bellows? If you've got a fire lover in the family who subscribes to the hunch-over-and-blow method, a bellows could be a fun and practical gift (or maybe you're just looking to buy one yourself). There aren't any hard fast rules to buying one. Basically, spend more than $5, and you should get something that will last a long time. Of course, you may want to spend a little more for something that looks handsome next to your hearth. You can get old-fashioned wood bellows on the Internet for around $100. What tools do you have next to your fireplace? Many folks with wood stoves or fireplaces have the three-tool combo set with a shovel, poker, and broom, but what about a container for the ash? (My dad used to just dump ashes into a paper grocery bag--but a metal container might have been a smarter choice.) Though you should wait three to four days after a fire burns out before cleaning up ashes and embers, a metal container is still a good bet, because it isn't flammable. The Jan. 2006 issue of Old-house Interiors recommends you choose one that "has a raised or double-walled bottom lining" and says "a tight-fitting lid prevents ashes from blowing about and starting another fire." What's a fireback, you ask? Basically, firebacks are decorative cast-iron panels made to stand behind the fire. Their purpose is to absorb heat and radiate it back into the room. Firebacks also protect the bricks in the back of the firebox from turning black with soot. In ye olden days when masonry fireplaces were commonly used to heat homes, they were used all the time. Today, when fireplaces are more for ambiance than heat, firebacks are less well known. They are still a good idea for increasing heat output, whether you're burning wood or flicking on gas logs in your fireplace. Also, they can look cool. Antique firebacks are highly desired if they can be found in good condition. Decorations stamped in the cast-iron could be anything from a hunting scene to a family crest. Of course, you can always buy new ones via Internet stores. Homeclick has a variety of firebacks such as this Large Oak Fireback (last I checked, they offered free shipping, which is nice, because these suckers are heavy! ).